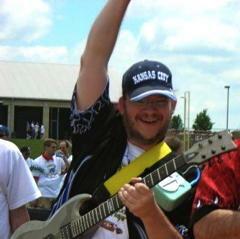 Next in our series of Greenfoot Hub Leaders is Daniel Green, leader of the Kansas City Hub. Daniel is a Java Systems Engineer with the Oracle Corporation, previously Sun Microsystems. Daniel has been part of the Java organization at Sun Microsystems and Oracle for thirteen years. He has been running computer club programs and workshops for six years, where students have opportunities to learn programming, make games and projects that emphasize computing as a tool for leveraging their creativity. Daniel works with students and teachers using tools such as Scratch, Alice, Greenfoot, Squeak, Dr. Java, Phun, OpenSim and others. Greenfoot and BlueJ have been particularly effective at transitioning from drag and drop environments like Scratch to similar game / scenario / simulation project environments using Java rather than a more complicated environment like NetBeans, Eclipse, or JDeveloper. Daniel first heard of Greenfoot from James Gosling during a conversation about computer science education, and it always seemed to be one of the coolest things at the ACM SIGCSE conference. When not teaching programming, Daniel is likely playing lead guitar in his band (which doesn’t involve a computer… yet…) or creating audio and video for theatrical performances for his local church (which involves more knobs, buttons and gizmos than most of the day job duties). Later this year, he plans to participate in the Immersive Education Initiative locally, extending programming into virtual worlds and augmented reality environments. Continuing our series of presenting the Greenfoot Hub Leaders, we introduce Stephanie Hoeppner, leader of the Greenfoot Hub Ohio. Stephanie is a Computer Science Teacher as well an Assistant Technology Coordinator for Clermont Northeastern Schools in Batavia, Ohio, USA. She has been involved in teaching computer science courses for twelve years at the high school level. Stephanie is also a Cohort Leader for the Computer Science Teacher’s Association (CSTA), in which her role is promoting computer science education through training and advocacy. Her experience with Greenfoot complements these efforts. Stephanie first encountered Greenfoot in Spring 2007. She had been looking for a different way to teach Java in her programming courses and Greenfoot was the perfect solution. She uses Greenfoot in conjunction with Alice for an introductory programming course and Greenfoot as a part of a secondary level course. Using Greenfoot has made a dramatic difference in the understanding and interest of the students. Outside of work, Stephanie spends time with her husband, children, and two dogs. They love living in a small country town with four acres of space for their children to run around. Most of Stephanie’s free time though is devoted to her children’s activities. Plans for the Ohio Hub have included a past workshop in December, an upcoming workshop at the Ohio Education Technology Conference Feb 1st, and a workshop tentatively set for April. See the Ohio Hub page for full details! 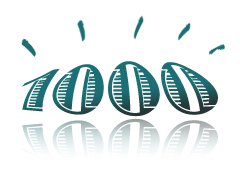 Still six weeks shy of its first birthday, the Greenroom has just welcomed its 1000th member. Yes, we have just hit the big 1000. When we designed the Greenroom, we had no idea that it would be so popular, grow so quickly, and attract so much attention. As the graph shows, the rate of people joining is quite steady. We had expected, that after a few months, all existing Greenfoot users would have found the Greenroom, and then the growth rate would slow, reflecting a much slower increase of new users. Many of the new members are indeed new Greenfoot adopters — it’s just that Greenfoot adoption has really taken off lately. Welcome to everyone who has joined recently! And the usual standard reminder: Don’t just sit back and read — get involved. Don’t wait for ‘them’ to do something. There is no ‘them’, there is only ‘us’. This is your community, and it is what you make of it. Making a start in our series introducing the Greenfoot Hub leaders is Adrienne Decker, leader of the Greenfoot Hub New York, located in Buffalo. 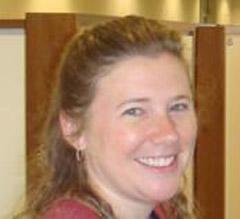 Adrienne is a Teaching Associate Professor at the University at Buffalo, SUNY in Buffalo, New York, USA. 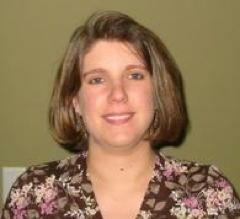 She has been involved in teaching introductory programming since starting at UB in 2001. During her time at UB, Adrienne has helped to redesign the introductory sequence into an objects-first curriculum and integrate the teaching of UML, graphics programming, and Java to make a fun introductory sequence for the incoming computer science and computer engineering majors. Adrienne first encountered Greenfoot in Spring of 2008, while looking for a way to make programming fun and engaging for an introductory programming for non-majors course at UB. Since then, she has been hooked and has transformed that course into an introductory programming course that uses Greenfoot exclusively. She frequently hears comments from her students in this course about how fun it is to program using Greenfoot. When not teaching programming, Adrienne enjoys spending time with her husband, her 2 children (both of whom are under 4 years old), and her dog (a German Shepherd). Plans for the New York Hub this year include a workshop (in conjunction with the New Jersey Hub) at the CCSC NE conference (April 15-16 in Springfield, MA) and a summer workshop in Buffalo in July. Watch the New York Hub website for dates and details about the summer workshop. Greenfoot is coming closer to your hometown. In an effort to bring Greenfoot support closer to our users, we have now started—in collaboration with a number of volunteers—to set up some Greenfoot Hubs in different places. These hubs will offer local workshops and training, support the community and help develop new material. Supporting the Greenfoot user community is something that we try to take seriously. We have put a large amount of effort into developing online support, be it via tutorials, videos, tech support mailing lists or the Greenroom. Online support is great - we can reach people that we otherwise would have no chance communicating with. However, online support is not the solution to everything. It has long been clear that the most effective and popular way of supporting teachers is via face-to-face workshops, training and discussions. This is the goal of the Greenfoot Hubs. 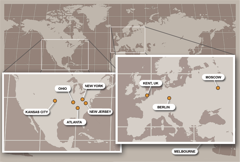 The US hubs are in Atlanta, GA, Madison, NJ, Buffalo, NY, Batavia, OH, and Kansas City, MO. Together with the Berlin and Moscow hubs and the pre-existing Greenfoot centres in Canterbury, Kent (UK) and Melbourne (Australia), this brings the total number of local hubs to nine. The Greenfoot Hubs will offer regular events for the Greenfoot community, both existing users and those new to Greenfoot. Several events are planned already — please have a look at the Greenfoot Hubs web page and see what is currently scheduled. If you are interested, and one of the events is local enough for you to get to – sign up now! If not, talk to the Hub leaders. Sometimes Hub Leaders are able to arrange workshops away from their home institutions. We hope to see many of you in one of our workshops over the next year! As we quickly approach the end of the year by many people’s calendars, this seems like as good a time as any for some reflections, a look back, a look forward and a few thank yous. On 1st March 2010, we officially opened the Greenroom. And it has been fascinating to watch ever since. We had been talking about the idea for such a site for quite some time before then. I had thought for a long time that it would be great to have a place where we could have a community of peers supporting each other, sharing, helping, working together, trying to make all our work easier and the lives of the kids we teach a bit better. I am a programmer, and I am used to work with technology. But at the end, it’s not about the technology, it’s about people. This — the building of the Greenroom — is the most directly social project I’ve worked on so far, and it was a bit scary at times. The main worry was that it wouldn’t work. I don’t mean that in the technical sense. We have excellent developers working on our team and I’ve always had faith in their ability to build the technology. I mean as a social experiment. “If you build it, they will come”, they say. I don’t think it’s true. All too often, you build it, and nobody bothers showing up. Then you and your mate Bob sit there staring at each other in silence, and cold wind blows through empty corridors. It isn’t quite that easy. There are many, many repositories of teaching resources that have tried and failed. People have said, only slightly facetiously, that there seem to be more repositories than teaching resources. The fact is that many projects, having built a repository, have struggled to keep it alive after the initial setup phase. How do you get people to spend their time posting resources? It is work! And for what reward? Each of those repositories lives in a self-reinforcing cycle: If people don’t post stuff, then the repository is not interesting. If it’s not interesting, no one looks at it. And if nobody looks, people don’t bother posting. How do you set the cycle onto a positive path? What is required to make a large, long-lived online group successful? — I can now answer with some confidence: It depends. So when we opened the Greenroom, we were very anxious to see whether people would sign up, and how they would interact with the site, and with each other. Before this Greenroom, there was a temporary one, a stop-gap measure while we were working on this implementation. It was a kind of “Greenroom 0.5” — the Greenroom run as a Google discussion group. This Google group existed for about six months, from September 2009 to March 2010. In that time, about 170 people signed up. Just about nobody posted resources. When we opened this new Greenroom and closed the Google group, only about half of them moved over. The other half disappeared. That, I thought, was not a good start. After just a couple of weeks, we exceeded the original number of 170, and then subscriptions just kept climbing! To this day, I have no idea where everyone was suddenly coming from. There was obviously some word-of-mouth going on somewhere, but I don’t know where or how or why. And what’s more: People (that’s you!) were not only signing up, they were also posting resources. After a very short time we had a good dozen resources in the room. That was about the threshold that I thought we must reach to make it worthwhile for teachers to come here and have a look, and not feel that they wasted their time. It became clear quite quickly that something here on this site was working. It was still a self-reinforcing cycle, but a positive one: You signed up in good numbers, posted resources, asked questions, participated in discussions, etc. The site became interesting, and more people kept coming. We, the Greenfoot team, relaxed a bit and watched in amazement. The Greenfoot team are Davin, Marion, Neil, Phil, Ian and Michael. The Greenroom implementation was built mostly by Neil and Phil. We, from the Greenroom team, would like to thank all of you for making this site what it is: An active community. We very much realise that we can build the technology, the shell that keeps this up, but only you can fill it with life and give it content, make it worth coming back for. This was scary for us at first, because it’s out of our control. At some stage all you can do is sit back and hope. We still don’t know for certain what has made this site work where others before have withered away. But something has. So, we would like to encourage you to keep this up. Keep asking questions in the discussion section (or start asking, if you haven’t in the past), post your resources, even if you think they aren’t great or aren’t finished, help improving what’s there, and continue this open, supportive conversation with your peers. We realise that one of the most effective way to learn about Greenfoot is in face-to-face workshops. However, until now, we were very restricted in how much we can travel, and how many workshops we can offer. To help overcome this problem, we are setting up several Greenfoot Hubs in different parts of the world. The hope is that we can - with the help of some volunteers running Hubs with us - deliver more workshops closer to where many of our users are. We are finalising preparations, and hope to announce more details about the hubs here soon. Two systems are chosen annually by Engineering Pathway to receive the Premier Award, a prize that marks outstanding contributions in engineering software. The award was presented at the Premier Award Ceremony at the Frontiers in Education Conference in Washington, D.C., where Ian and Davin from the Greenfoot Team were present to give a demonstration of the system and receive the prize. Greenfoot 2.0 has been released now. It offers a number of interesting new features, and might well be worth looking at. Greenfoot 2.0 is a major rework of Greenfoot. Apart from efficiency and stability improvements, it offers a number of new features that allow you to do more than ever before in Greenfoot. Some features, such as sound recording, mp3 playback, better sound control, and unbounded worlds offer more possibilities to scenario writers. Other new functions are aimed at improving the teaching and learning with Greenfoot. Among these are a new debugger and significant new editor functions. A summary of the new features is on mik’s blog. 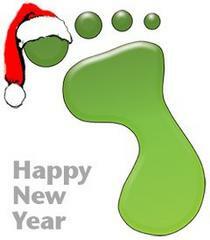 You can download Greenfoot 2.0 from the Greenfoot web site. The Greenfoot team is gingerly stepping into the age of the World Wide Web 2.0 for Trendy People: we’ve created a Twitter account. Most of us don’t know much about Twitter other than that it is a place where cricketers go to get fined, where people pitch comedy shows and that it is potentially faster than an earthquake – but I’m sure we’ll get the hang of it. If you want to follow us and perhaps suggest useful things we could do on twitter, we’re GreenfootTeam. 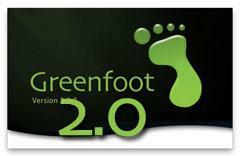 This month we will be releasing Greenfoot 2.0, a major new version of the software with many new improvements. You can find more information and leave comments in the post in the discussion forum. We would be interested in your thoughts, and look forward to sharing the software with you soon. 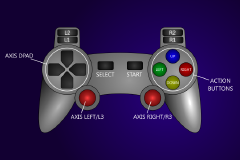 We have created a library that allows you to work with your game controller from within Greenfoot. Just plug your USB connected gamepad into your Mac or PC, use the GamePad class in Greenfoot, and off you go. This should work with a variety of devices, including PS2 and Xbox 360 controllers and others of similar design. Details about how to do this are here on the Greenfoot web site. This page provides a detailed description, including sample programs and a template to get you started quickly. This work was done by Joseph Lenton. The German translation of the Greenfoot book is nearing completion. This should be good news for young learners in Germany, for whom reading English is often a big stumbling block. The German translation of the book has just been announced in Pearson’s website. The original Greenfoot book has been translated to German for Pearson Studium, the German branch of Pearson Education, by Carsten Schulte, a long-standing member here in the Greenroom. It is scheduled for publication around the end of June. I haven’t held the book in my hands yet, but from what we can see on the website it’s beautifully produced. It has been set and printed in full colour, with coloured syntax highlighting in source code and high quality illustrations. The Pearson website offers a sample chapter (“Probelesen”) for those who’d like to have a look. Happy Birthday, Greenfoot! 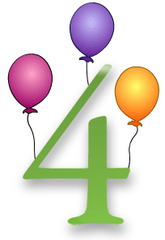 Today, Greenfoot turns four. 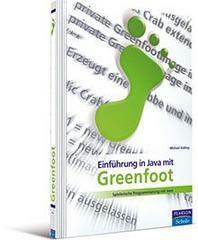 Greenfoot 1.0 was released on 31 May 2006. Yes, Greenfoot is really four years old already. If you are interested in its history, there is an online Version History to look at, that shows the dates of all past releases. So, let’s raise a glass and have a quick drink to a bright future. May thousands more kids discover the joy of programming through Greenfoot and other systems in similar spirit!